This set of pegs has an adjustable heel rest, both are 5" long. 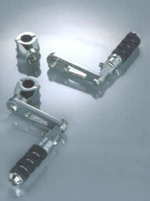 The pegs and heel rests can be set to any desired angle and locked securely in place. They will fit with all RIVCO highway mounts including the Engine Guard Clamps listed below. Includes clevis and mounting bolts. Engine guard clamps required, sold separately.